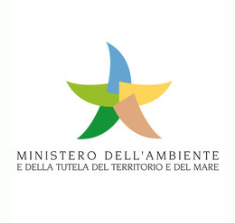 The Italian Ministry for the Environment Land and Sea, established in 1986, is in charge of governing and supervising the environmental problems. It detains responsibilities related to sustainable development, protection of territory, pollution and industrial risks, international protection of the environment, appraisal of environmental impact, nature conservation, waste and cleanup, and protection of seas and inland waters. The Italian Ministry for the Environment Land and Sea is strongly committed to promoting and supporting international partnership and cooperation towards global sustainable development. In fact, the Italian Ministry for the Environment Land and Sea (IMELS), together with the State Environmental Protection Administration of China (SEPA), the Ministry of Science and Technology (MOST) of China, Chinese Academy of Social Sciences (CASS) and both Beijing and Shanghai Municipal Governments, has started an intense cooperation program on environmental protection. For project development, the ALLCOT Group combines its finance and project development experience with a proven track record in carbon offset trading to maximize the risk-adjusted revenue potential in all of its undertakings. ALLCOT supports GD MAJOR’s sustainability efforts by offering environmental and sustainable services. They develop sustainable energy programs and create innovative solutions for carbon offsets. 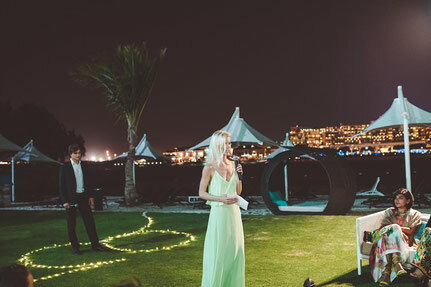 In addition, a sustainability report is released by ALLCOT after every Green Fashion Week, in order to record the carbon emissions and the necessary offsets. 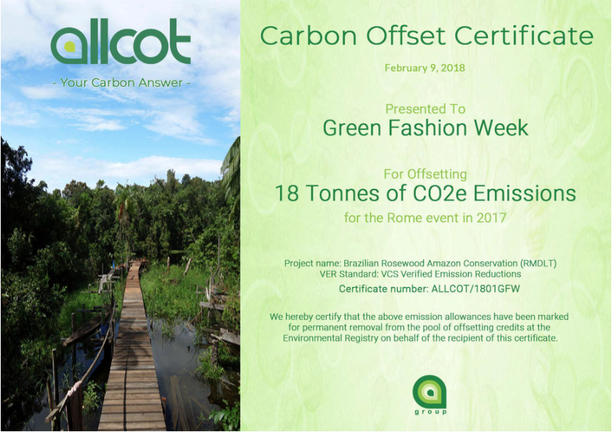 For the 6th edition of Green Fashion Week - Rome 2017, ALLCOT has released the carbon offset certificate here beside. Their roots in the compliance carbon market provide a strong foundation on which they have built a robust service offering a wide range of environmental and sustainability services whereby their clients can take advantage of a strong and motivated team that is able to deliver innovative solutions. United Nations Climate Changes aims to develop sustainability and “green solutions” as the new engine of growth. Particularly, the UN Framework Convention on Climate Change (UNFCCC), through the climate neutral now initiative, works to promote resource efficiency and sustainable consumptions. GD MAJOR follows the UN’s guidelines for a Climate Neutral Event, which entails the measurement, reduction and offsetting of the carbon emissions generated during the whole event. The more we engage in this important initiative, the more we can help and be part of the global solution. Green Fashion Week is proud to be one of the signatories of the Climate Neutral Now, an initiative run by the United Nations Framework Convention on Climate Change. It invites all organizations and individuals to measure their GHG footprint, reduce it as much as possible and offset the rest using UN certified offsets. At the Green Fashion Week we believe that each of us has a role to play in fighting climate change. 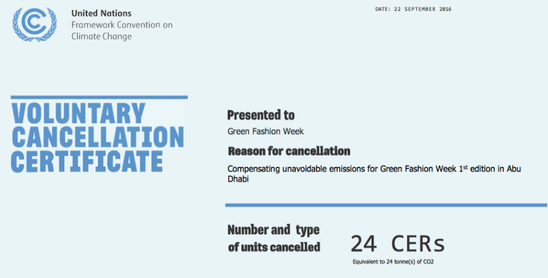 While our core work is to promote sustainable fashion we went a step beyond to ensure that emissions generated as a result of the Green Fashion Week are compensated by investing in reduction somewhere else. Join us in the journey to a climate neutral world and reduce your impact on the environment as much as you can. Here beside, the UNFCCC Offsetting Certificate released to GFW for the Abu Dhabi's Edition. 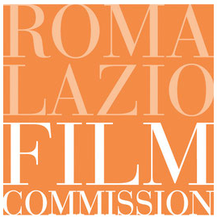 The ROMA LAZIO FILM COMMISSION, founded on February 5, 2007, encompasses the Lazio Region, the Municipality of Rome, the Province of Rome, the Province of Frosinone, the Province of Rieti and the Province of Viterbo. Its goal is "to encourage national and foreign film and audiovisual producers to invest and produce in Rome and the region, to promote the image of Rome and Lazio region and to publicize its natural and cultural heritage and to encourage increased competition throughout the area" (Founding statement of the ROMA LAZIO FILM COMMISSION). 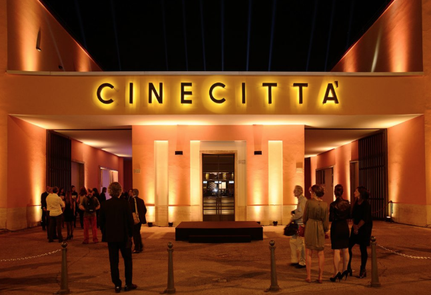 The Foundation, into its headquarters at Studi Cinematografici Cinecittà, continues to carry out activities aimed at promoting cinema, audiovisual media and coproductions, serving as a point of contact between the principal national and international companies and Lazio, the traditional land of great cinema. It also provides a platform for the development of International coproduction during the main film festivals (Cannes, Berlin, Rome, Hong Kong, Singapore, Mumbai). The beautiful Daniela Christiansson is the official ambassadress of GFW and Climate Neutral Now. Sweden model fond of everything that results sustainable, Daniela supports fashion consciousness with her blog Green Model Me. During UN speech, she declares: "Hi, I am Daniela Christiansson, I am talking to you as Ambassadress of GD Major Entertainment and as Champion of Climate Neutral Now initiative launched by the United Nations climate change secretariat in September of last year". She continues: "You may ask what fashion has to do with climate change and what should the industry do to address the issue?! Well, fashion as most industries, has a direct impact on the environment and is the second most polluting industry, after the oil one. The processing of raw materials, the amounts of water used, associated travel, etc. they all contribute to the emission of greenhouse gasses which are causing climate change. The arrival of fast fashion and the massive increase in number of items that we are buying and sometimes quickly discarding means that the industry’s impact on climate change is only getting greater. As we all know, fashion sets a distinctive trend in the style in which a person lives.". 3) offsetting what it can't be reduced using UN-certified emissions reductions. Daniela concludes: "This is why fashion is in a unique position to promote a climate-friendly lifestyle as a prevailing behaviour. As an industry I believe that we can and must have a greater role in tacking climate change which is why I've already pledged to personally become Climate Neutral and have involved with me Green Fashion Week in measuring, reducing and offsetting the carbon emissions generated during the whole event with UN certified emission reductions. The more we engage in this important initiative, the more we can help and be part of the global solution". See the video here beside and learn how to calculate and offset your climate footprint!